These round baked goods are both tasty and healthy. Could you ever imagine a dessert that doubles as a wall decoration? In Russia, of course, everything is possible. Here’s the story of this simple but very versatile baked good. 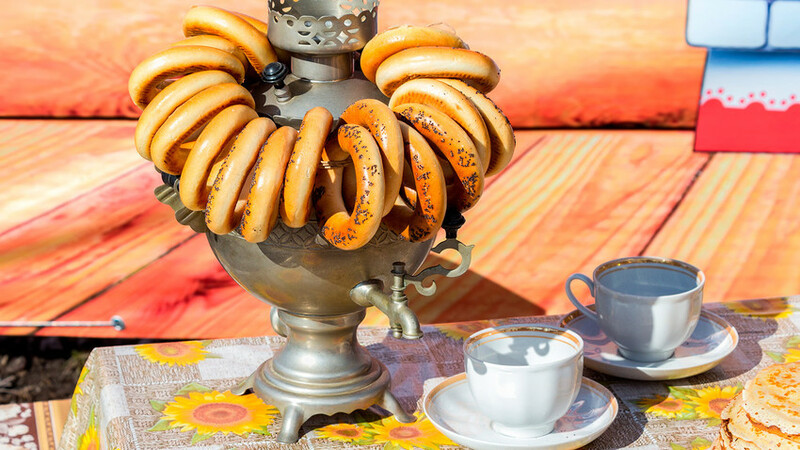 In 17th century Russia people decorated the walls of their homes with round baked goods, such as baranki, in order to emphasize their prosperity. This custom had a pagan meaning due to the fact that baranki (as well as bubliki and other types of baked delights) symbolized the sun. By showing that your house is full of solar symbols you attract more sun, and therefore, more wealth. All kinds of baked goods were useful for decorating walls because they have a hole that allows them to be easily stringed. In the 18th and 19th centuries, street vendors sold baranki in strings put around their neck, almost like a large necklace. Baranki’s main special feature is the unique cooking technology. They’re first boiled, then dried and finally baked. Even their name derives from the ancient Slavic word, obvariti (to parboil); a second version states that it comes from the word, baran (ram), because of its resemblance to a ram’s horn. Historians insist that baranki originated in the town of Smorgon, which changed countries many times because of shifting borders – from the Grand Duchy of Lithuania, to the Polish-Lithuanian Commonwealth, then the Russian Empire, and now Belarus. Eventually, the tasty rings started their journey to Northwest Russia, and then triumphantly throughout the country. Like kalachi, baranki required a specially trained person to bake them; an ordinary baker wasn’t capable of doing the job right. Such a person was called baranochnik (‘the one who deals with baranki’). Baranki made in Valdai were considered the best and are even mentioned in the works of Pushkin and Alexander Radishev, the renowned 18th century author and social critic. Of course, every family had its own unique recipe, considered the one and only. Dough used for baranki varied: Lenten or rich, with eggs, sugar or fruits. 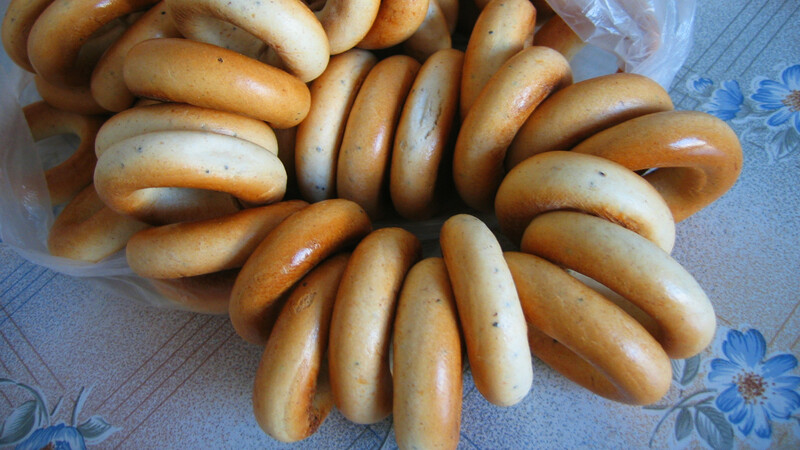 Baranki with sesame or poppy seeds were considered the most exquisite. By the way, baranki are the thinnest of all baked goods, and have low sugar content and no fats at all. So, they are perfectly suitable for those on a diet or who prefer healthy eating. Grind yeast with sugar, and add warm milk. Knead thoroughly, add flour, butter, egg and salt. Put in warm place. When the dough rises, knead again. Form cylinders the thickness of a finger. Make rings - these are our future baranki. Paste the junctions together with egg whites. Time to boil! For baranki to have more yellowish color add a bit of sugar to the water, and if you want them to have a more glossy surface then there is one special trick: take 50 g flour, add 25 g water (room temperature), and knead. Leave for 20 minutes, and then wash the dough (not kidding!). Cover baranki with this paste. You can sprinkle your baranki with sesame or poppy seeds. Put them on baking paper; please note that they shouldn’t touch one another. Bake for 15-20 minutes. In the end, you’ll have wonderful Russian baranki, soft inside and with a crispy crust. Impossible not to try them immediately - better with tea as Russians usually do.